Tolnaftate is a synthetic thiocarbamate used as an anti- fungal agent that may be sold without medical prescription in most jurisdictions. It may come as a cream, powder, spray, or liquid aerosol, and is used to treat fungal conditions such as jock itch, athlete’s foot and ringworm. It is sold under several brand names in including Tinactin, odor Eaters, Absorbine, Aftate, Ting (85) . Tolnaftate is a topical fungicide. Though its exact mechanism unknown, it is believed to prevent Ergosterol biosynthesis by inhibiting squalene epoxidase (86) . It has also been reported to distort the hyphae and to stunt mycelia growth in susceptible organisms (87) . Tolnaftate, a pharmacologically inert new fungicide for topical treatment of superficial mycoses, has been reported to be highly effective in skin infections caused by common pathogenic fungi as well as being non- irritating and non- sensitizing. It is a fungicidal invitro. During clinical investigation, studies showed no changes in the blood and urine of patients given tolnaftate topically, suggesting that the drug is not toxic to the kidney or the hematopoietic system. Distorts hyphae and inhibits mycelia growth in susceptible fungi. The anti- dermatophyte agent to tolnaftate was compared with the allylamine anti-fungal compounds naftifine and terbinafine. Tolnaftate was shown to inhibit sterol biosynthesis at the level squalene epoxidation and squalene was shown to accumulate in dermatophytes grown in its presence. Biochemical studies in whole and broken cells supported this conclusion and showed that the compound was active against squalene epoxidation in broken candida albicans cells, but was mwch less potent against whole cells. These results suggested there was a barrier to penetration in these yeasts (88) . Topical/ cutaneous: Superficial dermatophyte infections, pityriasis versicolor. Adult: Apply a 1% gel / solution /powder /cream bid for 2-6 weeks; repeat if necessary. Continue treatment for 2 weeks after disappearance of all symptoms to prevent recurrence of infection. Pc; kelecin; LECITHIN; Alcolec-S; granulestin; L-Lecithin; LIPOID(R)E80; Lecithin, NF; Phospholutein; E322; egg lecithin; LSC 5050; LSC 6040; mixed soybean phoaphatides; ovolecithin; Phosal 53 MCT; Phospholipon 100 H; Prokote LSC; soybean lecithin; soybean phospholipids; Sternpur; vegetable lecithin (89) . 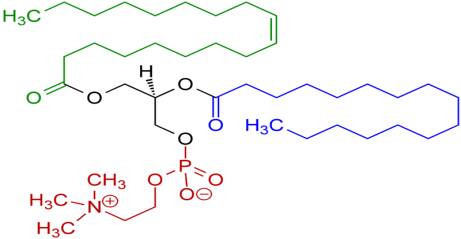 Where red – choline and phosphate group; black glycerol; green-unsaturated fatty acid; Blue saturated fatty acid. Lecithin occurs light yellow to dark brown, transparent or translucent, viscous liquid substance, as white to brown powder or granules, or as a light yellow to dark brown lump, having a slight, characteristic odour and taste. Identification: (1) Place 1 g of lecithin into a kjeldahl flask, add 5 gm of powdered potassium sulphate and 0.5 gm of cupric sulfate, and 20 ml of sulfuric acid. Tilt the flask at about 45ËšC angle, heat gently until the effervesense , and raise the temperature to boiling. After the contents become blue, transparent solution, heat for 1-2 hours, cool and add an equal volume of water. Take 5 ml of this solution, and add 10 ml of ammonium molybdate solution (1 → 5), and heat. A yellow precipitate is formed. (2) To 0.5 g of lecithin, add 5 ml of diluted hydrochloric acid(1→2), heat in a water bath for 2 hours and filter. Use this solution is considered as a test solution. Perform paper chromatography with 10 µl of the test solution, using choline chloride solution (1 →200) as the control solution and a mixture of n-butanol, water, and acetic acid (4:2:1) as the developing solvent. A red orange spot is obtained from the control solution is observed. In paper chromatography for the filter paper, use a No. 2 filter paper. Stop the development when the developing solvent rises about 25 cm, air-dry, spray with Dragendorffs reagent to develop a colour, and observe in daylight (90) . Insoluble in cold water and also acetone. Soluble in about 12 parts of absolute alcohol. Soluble in chloroform, petroleum ether, mineral oil and fatty acids. Sparingly soluble in benzene. Insoluble in cold vegetable oils and animal oils (91) . Glass transition temperature is 170–180 ºC. Lecithin is a generic term to designate any group of yellow-brownish fatty substances occurring in animal and plant tissues, and in egg yolk. It is naturally composed of phosphoric acid, choline, fatty acids, glycerol, glycolipids, triglycerides, and phospholipids. It is often used as an emulsifying agent.Available in variety of forms including granules, soft gels and chewable tablets. Lecithins are used in a wide variety of pharmaceutical applications. They are also used in cosmetics and food products. Lecithins are mainly used in pharmaceutical products as dispersing, emulsifying, and stabilizing agents, and are included in intramuscular and intravenous injections, parenteral nutrition formulations, and topical products such as creams and ointments. Lecithins are also used in suppository bases to reduce the brittleness of suppositories, and have been investigated for their absorption-enhancing properties in an intranasal insulin formulation. Lecithins are also commonly used as a component of enteral and parenteral nutrition formulations. There is evidence that phosphatidylcholine (a major component of lecithin) is important as a nutritional supplement to fetal and infant development. Furthermore, choline is a required component of FDA-approved infant formulas. Incompatible with esterases owing to hydrolysis. Lecithins may be irritant to the eyes; eye protection and gloves are recommended. GRAS listed (Generally Recognized as Safe). Accepted for use as a food additive in Europe. Included in the FDA Inactive Ingredients Database (inhalations; IM and IV injections; otic preparations; oral capsules, suspensions and tablets; rectal, topical, and vaginal preparations). Included in nonparenteral and parenteral medicines licensed in the UK. Included in the Canadian List of Acceptable Non-medicinal Ingredients. Ablunol S-80; Arlacel 80; Armotan MO; Capmul O; Crill 4; Crill 50; Dehymuls SMO; Drewmulse SMO; Drewsorb 80K; E494; Glycomul O; Hodag SMO; Lamesorb SMO; Liposorb O; Montane 80; Nikkol SO-10; Nissan Nonion OP-80R; Norfox Sorbo S-80; Polycon S80 K; Proto-sorb SMO; Protachem SMO; S-Maz 80K; Sorbester P17; Sorbirol O; sorbitan oleate; Sorgen 40; Sorgon S-40- H; Span 80; Tego SMO. Span80 occur as Yellow viscous liquid with a distinctive odour and taste. Sorbitan esters are generally soluble or dispersible in oils; they are also soluble in most organic solvents. In water, although insoluble, they are generally dispersible. Emulsifying agent, non ionic surfactant, solubilizing agent, wetting, dispersing and suspending agent. A non-ionic surfactant that can be used to form oil-in-water emulsions and in combination with low HLB surfactants can form water-in-oil emulsions. EPA approved oil spill dispersant. Sorbitan monoesters are a series of mixtures of partial esters of sorbitol and its mono- and dianhydrides with fatty acids. Sorbitan diesters are a series of mixtures of partial esters of sorbitol and its monoanhydride with fatty acids. Sorbitan esters are widely used in cosmetics, food products, and pharmaceutical formulations as lipophilic nonionic surfactants. They are mainly used in pharmaceutical formulations as emulsifying agents in the preparation of creams, emulsions, and ointments for topical application. When used alone, sorbitan esters produce stable water-in-oil emulsions and microemulsions but are frequently used in combination with varying proportions of a polysorbate to produce water-in-oil or oil-in-water emulsions or creams of varying consistencies. Sorbitan monolaurate, sorbitan monopalmitate and sorbitan trioleate have also been used at concentrations of 0.01–0.05% w/v in the preparation of an emulsion for intramuscular administration. Gradual soap formation occurs with strong acids or bases. Sorbitan esters are stable in weak acids or bases. Sorbitan esters should be stored in a well-closed container in a cool, dry place. Sorbitan esters are widely used in cosmetics, food products, and oral and topical pharmaceutical formulations and are generally regarded as nontoxic and nonirritant materials. However, there have been occasional reports of hypersensitive skin reactions following the topical application of products containing sorbitan esters. When heated to decomposition, the sorbitan esters emit acrid smoke and irritating fumes. The WHO has set an estimated acceptable daily intake of sorbitan monopalmitate, monostearate and tristearate and of sorbitan monolaurate and monooleate at up to 25 mg/kg body-weight calculated as total sorbitan esters. Certain sorbitan esters are accepted as food additives in the UK. Sorbitan esters are included in the FDA Inactive Ingredients Guide (inhalations; IM injections; ophthalmic, oral, topical and vaginal preparations). Sorbitan esters are used in nonparenteral medicines licensed in the UK. Sorbitan esters are included in the Canadian List of Acceptable Non-medicinal Ingredients. Glycospere O-20; Hodag PSMO-20; Liposorb O-20; Liposorb O-20K; Montanox 80; Polyoxyethylene 20 oleate; Protasorb o- 20; Ritabate 80;(Z)-sorbitan mono -9-octadecenoate poly(oxy1,2- ethanediyl) derivatives; Tego SMO 80; Tego SMO 80V; Tween 80. It is colorless to light yellowish viscous liquid. Soluble in water and also soluble in ethanol. Insoluble in mineral oils. Polyoxyethylene sorbiton fatty acid esters (polysorbates) are a series of partial fatty acid esters of sorbitol and its anhydrides copolymerized with approximately 20, 5 or 4 moles of ethylene oxide per each mole of sorbitol and also sorbitol anhydrides. The resulting product is therefore a mixture of molecules of varying sizes rather than in single uniform compound. Polysorbates containing 20 units of oxy ethylene are hydrophilic nonionic surfactants that are used widely as emulsifying agent in the preparation of stable oil-in-water pharmaceutical emulsions. They may also be used as solubilizing agent for a variety of substances including essential oils and also other oils like oils are soluble vitamins, and teen 80 as a wetting agent in the formulation of oral and parenteral suspensions. They also have been useful in improving the oral bioavailability of drug molecule that are substrates for P-glycoprotein. Polysorbates are also used in cosmetics and also food products. Polysorbates are stable to electrolytes and week acids and bases; gradual saponification occurs with strong acids and strong bases. This type of oleic acid esters are sensitive to oxidation. Polysorbates are hygroscopic and should be examined necessary for water content before to use and dried if necessary. Prolonged storage of tween 80 along with other polyoxyethylene surfactants can leads to the formation of peroxides. Polysorbates should be stored in a well closed containers, protected from the light, in a cool and dry place. Discoloration and /or precipitation occur with various substances especially phenols, tannins, tars, tar like materials.The anti microbial activity of paraben preservatives is reduced in the presense of polysorbates. Polysorbate60, 65and 80 are GRAS listed. Polysorbates 20, 40, 60, 65and 80 are accepted as food additives in Europe. Polysorbates 20, 40, 60, 65and 80 are included in the FDA inactive ingredients guide (IM,IV,oral,rectal,topical and vaginal preparations). Polysorbates are included in parenteral and non parenteral medicines licensed in the UK. Polysorbate such as 20, 21, 40, 60, 61, 65, 80, 81, 85 and 120 are included in the Canadian list of acceptable non medicinal ingredient. "Tolnaftate Drug Profile:." UKEssays.com. 11 2018. All Answers Ltd. 04 2019 <https://www.ukessays.com/essays/chemistry/tolnaftate-drug-profile-7809.php?vref=1>. "Tolnaftate Drug Profile:." All Answers Ltd. ukessays.com, November 2018. Web. 24 April 2019. <https://www.ukessays.com/essays/chemistry/tolnaftate-drug-profile-7809.php?vref=1>. UKEssays. November 2018. Tolnaftate Drug Profile:. [online]. Available from: https://www.ukessays.com/essays/chemistry/tolnaftate-drug-profile-7809.php?vref=1 [Accessed 24 April 2019]. UKEssays. Tolnaftate Drug Profile: [Internet]. November 2018. [Accessed 24 April 2019]; Available from: https://www.ukessays.com/essays/chemistry/tolnaftate-drug-profile-7809.php?vref=1.